This article was originally printed in SHFG's Federalist, No. 56, Winter 2017. To subscribe to The Federalist and access all of its content, please join SHFG at http://shfg.wildapricot.com/join-us. As the world’s largest biomedical library, the U.S. National Library of Medicine (NLM) at the National Institutes of Health houses a vast collection of print and electronic materials filled with medical information, research and history. NLM’s most amazing resource is the History of Medicine Division (https://www.nlm.nih.gov/hmd/index.html), which collects, preserves, makes available, and interprets for diverse audiences one of the world’s richest collections of historical materials related to human health and disease. The collections include thousands of volumes of rare and historical materials dating as far back as the 11th century. From its earliest origins in 1836, as the U.S. Surgeon General’s library, to the present, NLM provides endless expertise and medical information to the public, here and abroad. One of the joys of working in the History of Medicine Division of this great library is being close to its world-renowned historical collection spanning ten centuries and representing nearly every part of the globe. These unique and rare materials not only open a window to medical history, but intersect with and reflect economic, political and social history. Sometimes they even inspire popular culture. The History of Medicine collections include beautifully illustrated books authored by great Renaissance scientists and thinkers like Nicolas Flamel, Paracelsus, Cornelius Agrippa, and Ambrose Paré. If these names sound familiar to you, it is probably because you have read about them in the enormously popular Harry Potter book series. Influenced by these real-life historical figures in science and medicine, J.K. Rowling’s research into history is clearly reflected in her Harry Potter series. The character Nicolas Flamel, a French alchemist, is the maker of the philosopher’s stone, believed to be a key to immortality and Cornelius Agrippa, a noted German occultist, alchemist and physician, is featured on a wizard card found inside a Chocolate Frog treat collected by Harry Potter and his friends at Hogwarts School of Witchcraft and Wizardry. The history documented in these historical scientific books and the popular story of Harry Potter first crossed paths at the NLM several years ago, when one of the library’s reference librarians brought a small French volume, La Metallique Transformation, into the Exhibition Program offices as an example of how he engages with young people who visit the library. The author, to our great surprise, was Nicolas Flamel, who we were all familiar with from the Harry Potter books. The librarian used this rare historical volume to introduce medical history to his young visitors, making a connection between history and contemporary life and bringing relevance to their visit. From that simple introduction to a volume in the History of Medicine collections, came a small exhibition at the library and an enormously successful traveling banner exhibition whose popularity has kept six copies traveling around the country since 2009. This past June, to celebrate the 20th anniversary of the first publication of J.K. Rowling’s Harry Potter and the Philosopher’s Stone (published in the United States as Harry Potter and the Sorcerer’s Stone), the NLM created a special display that featured the library’s traveling banner exhibition Harry Potter’s World: Renaissance Science, Magic and Medicine (https://www.nlm.nih.gov/exhibition/harrypottersworld/) alongside a display of 15th, 16th and 17th century books that influenced the Harry Potter series. 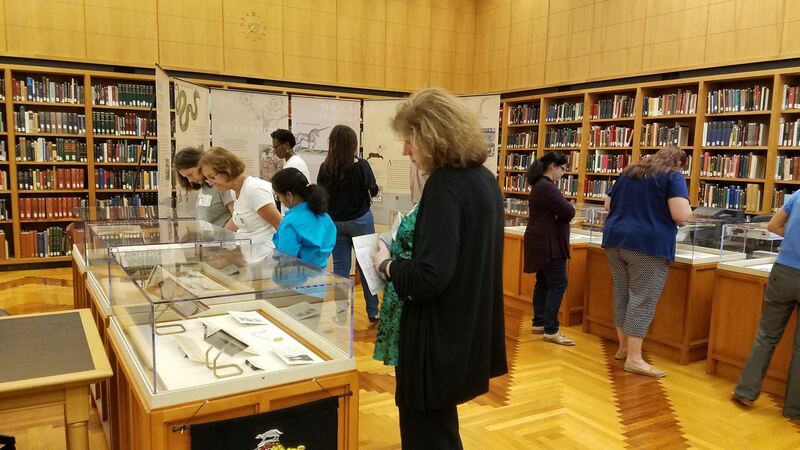 This juxtaposition of history and popular culture attracted over 600 visitors, both adults and children, to the History of Medicine reading room during the week-long exhibit. Visitors spent quality time exploring the books on display, learning the history they contained and using it to spark their imagination to learn more about the connections between history and Harry Potter as they reflected on the story they loved so much. Many explored the fully digitized historical books online, and some young students used these materials to create stories of their own. The excitement and joy was palpable and it was wonderful to see how a creative approach to history can stimulate and inspire people of all ages. History and Harry Potter indeed go hand-in-hand and NLM discovered a way to creatively engage their audiences in the intersection between history and popular culture. The great success of the library’s exhibition is a testament to the popularity of the Harry Potter series, to the power of libraries everywhere to engage the mind, and to the excitement of learning how history influences literature and modern-day life. The author, Jill L. Newmark, is an exhibition registrar, curator, and manager of traveling exhibition services at the U.S. National Library of Medicine. Quick reminder that the annual Hewlett lecture will be held tomorrow, October 18 at 6pm. Please join us! Welcome to the new SHFG Blog! More to come and thanks for your continued support!